Recreational fishing kayaks are designed for people who want a shorter and more compact kayak for fishing. They are easy to manoeuvre both on and off the water and are easy to car top on your own. Recreational fishing kayaks are suitable for travelling shorter distances and are ideal for fishing on freshwater and for shorter in land sheltered coastal waters. The Moken 10 Lite is a superb light, and compact fishing kayak. This nimble, stable kayak features Feelfree’s innovative new quick release modular track system and Easy Seal hatch. The Moken 10 Lite’s compact design and light weight make it perfect for accessing rivers and smaller lakes and Feelfree’s Wheel in the Keel makes transport a snap. Is the ultimate short fishing sit on top. The Moken 10 has a trimaran hull which provides a super stable platform and good tracking when being paddled, yet with a sweep stroke and bow rudder this boat will have you facing the other way before you know it. The Fun Kayaks Fishing Pro 10 is a lightweight, compact fishing kayak. Lightweight, short and easy to lift make for easy storage, transport and car roof rack loading. These kayaks have been designed specifically for fishing and offer more performance and capabilities than a recreational fishing kayak. They are generally longer which makes them suited to longer distances on both fresh and coastal waters. These kayaks are also packed full of features to help you get the most out of your fishing trip. 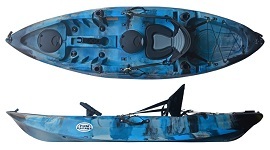 The FeelFree Moken 12 Angler is a feature packed Sit On Top Kayak for sit on top kayaking and kayak fishing. The Moken 12 Angler offers great speed and directional stability for touring. The Fun Kayaks Fishing Pro 12 is the longer, faster version of the Fishing Pro 10. Ideal for those wanting to cover slightly longer distances or wanting more forward speed or storage space. The Moken 12.5 from FeelFree is packed with excellent features that are sure to make this an ideal kayak for any paddler wanting to go fishing. The Moken 12.5 has amazing stability and has a designated standing area enabling the paddler to cast effortlessly into those fish hot spots. The Viking Profish 400 lite sits in the mid size category of fishing kayaks and offers great comfort, performance and stability. The Profish 400 lite takes Viking's incredibly robust design and wraps it in a package weighing just 24kg. The Lure range offers the ultimate in stability and also offers an exceptional fishing platform for fishing on inland and sheltered waters. The Profish GT is a compact, easily managed and incredibly manoeuvrable yet stable fishing kayak. The 4WD of Viking's Profish line up. The Viking Profish Reload combines the very best features of both the Viking Profish 400 lite and the Viking Profish 440. It's a Fast yet stable fishing kayak packed full of features and offers the kayak angler with one of the finest fishing kayak available. The Viking Profish Reload is a serious fishing kayaks which is a fast, stable kayak to fish from. The Railblaza Edition Reload is supplied with various extras including Angler Rudder and Railblaza G-Hold, Starport HD Rod Holder II and 300m TracPort accessories! Updated for 2017, the Trident 13 Angler is a well equipped 13 ft fishing kayak suitable for inland and coastal kayak fishing. The Feelfree Lure 13.5 is longer, faster, extremely stable and a capable bigger water version of the Lure 11.5. Fast and sleek fishing Sit On Top, designed for speed and performance rather than width and stability. 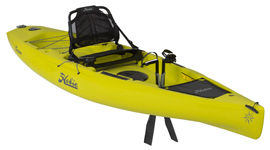 Hobie Kayaks can be propelled by either a paddle or the mirage drive system by using your feet, this offers the kayak fisherman a hands free alternative. Hobie fishing kayaks can be controlled by pedalling, leaving your hands free for trolling, working a lure or casting. They are stable yet fast fishing kayaks and are packed full of features for the kayak fisherman. The Outback just got better! 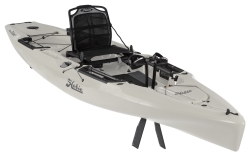 Hobie's best selling fishing kayak has been given a make-over and now comes complete with a stack of features to make this one of the best fishing kayaks available! The newest addition to the Hobie Mirage fleet, the Mirage Compass offers a combination of features from the best-selling Revolution and Pro-Angler models in a simple, great value, high performance package. The Hobie Revolution is the most popular out of the range. Its an all-rounder, a superb balance between speed and stability. Its sleeker design is still stable enough for fishing, touring and exploring. The Hobie Revolution 16 is for someone looking to cover good distance or for fitness training. Its sleek, long water line makes this the quickest Hobie. But still stable enough for a spot of fishing. Sit on Top Kayaks that can be paddles using a kayak paddle, peddled using your feet or motorized via a electric motor. Perfect for fishing as this leaves the kayak fisherman hands free. These kayaks are super stable and are great platforms for fishing. Riot Kayaks Mako 10 – The most affordable and lightweight pedal drive kayak available on the market! Stable, fast, light and packed full of features. Great for lakes, estuaries, sea and rivers. The Mako 10 can do it all. The modern evolution of pedal and powered kayak propulsion offering effortless speed, ease of use and adaptability. The Lure 13.5 Overdrive is bigger version of the 11.5 designed for the kayak angler that wants it all. Gumotex make some of the best inflatable kayaks around and their range includes specialist inflatable fishing kayaks. Specialist inflatable fishing kayak, offering a new type of angling adventure. It is possible to enjoy fishing even in hard-to-reach, remote locations. Made from the tough Nitrilon material. The Alfonso is an inflatable boat designed for anglers that can be used as up to three-seater. An outboard motor (Max 2.6KW / 3.5HP) can be attached to the transom.